Spain El Gordo literally means the fat one or can be translated as the big one. It is one of the Spanish state lotteries. It was launched on 29 October 1993 and was set up exactly the same as La Primitiva and draws were held monthly. In 2005, rules have changed, draw happens once a week, every Sunday at 9:00 pm Spain time. In August 2011, after several roll overs, the jackpot reached €33,024,545, which is the largest amount a single Spain El Gordo player has ever won! Match all 5 main numbers to win the jackpot prize. The code number covers all line on the ticket and is chosen once per ticket played. Tickets whose code number matches the drawn code will win consolation prize of €1.00. Select 5 main numbers from selection of 1-54 and 1 code number (per 6 lines) from 0-9. Choose “Lucky Pick” option to play with auto-generated numbers. Add another line if you wish. You have the option to play from 1 line up to 30 lines per ticket. If you wish to add more, you can play for additional tickets. Draw happens once a week - every Sunday. Select your weeks. You can play for the nearest draw or choose to play for multiple future draws. Review your selection then click “Check Out”. You will receive your OneLotto official ticket(s) after placing an order with us. You can view this ticket within your “My Account“ page. After the official announcement of winning numbers and prize breakdown, OneLotto will publish and upload the results onto our website. We will also send out a full result email to all participating players of the draw. There are 8 prize categories offered for each draw and then another one for matching the code number. 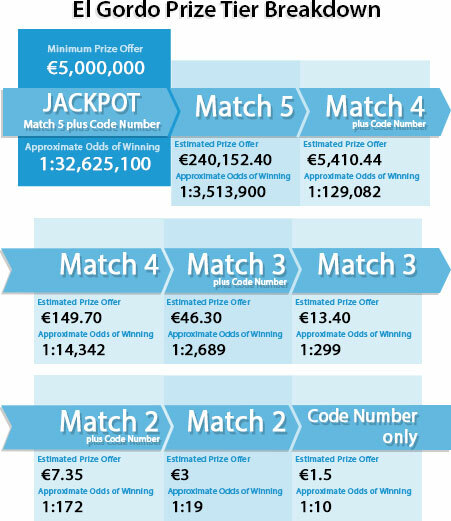 The jackpot prize has a guaranteed minimum amount of €5 Million. In case of having more than one winning matching ticket for any prize category, the prize is shared in equal parts among all winning tickets. In the case there are no jackpot winners, 50% of the amount reserved for the jackpot is accumulated to the guaranteed amount for the next drawing and leads to huge jackpot amount.